People never get enough of love stories. The beauty of love and pain of separation is beautiful to watch on screen. And what’s better than something that has already been accepted by the audience? The movie industries on both sides of the globe have realised this fact long ago. They have perfected the art of cashing in on something that is already a hit, and then turning it into an even bigger money-spinner. Both books dealt with these issues deftly, and left their readers smiling and crying all at once. Each of them were bestsellers. They each had their critics, but their target audience was more than satisfied. And that’s where showbiz steps in. The book described its characters’ illness, in a shocking, brutally honest manner. Cancer is not beautiful. Its victims, and their families, face horrifying indignities and terrible pain. 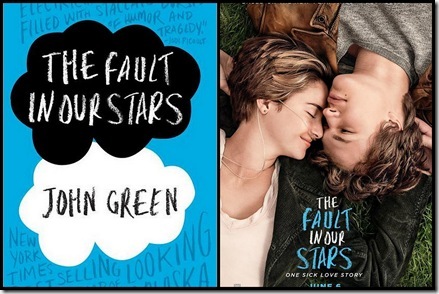 And John Green has not skimmed over the unpleasant bits. Hollywood, however, decided that grim reality might frighten theatre-goers. So it sugar-coated the last part of the story so much that the whole essence of the book was lost. Also, the director has cut some characters and instead focused completely on Hazel and Gus. Hazel’s mom and van Houten are given short shrift. Much of the philosophy from the book doesn’t make it to the screen. Why? 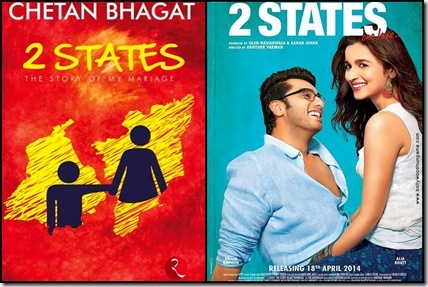 2 States – the movie is similarly flawed. The movie starts to fall apart in the second half. Many parts of the book were cut. Just like TFIOS, the less pretty aspects explored in the book – certain incisive dialogues, the social commentary unrelated to the North-versus-South divide – have been ruthlessly excised. What remains is a rehash of typical Bollywood movies that have already worked, reconstructed around Chetan Bhagat’s plot. So, children, what do we learn from the above examples? 1. If you really love a book, if it speaks to you, DO NOT WATCH THE MOVIE. Whether it was manufactured (and I do not apologise for my use of that word one bit) in the East or the West, ultimately the makers are driven by market considerations and not by the desire to create a great movie. 2. The filmmakers try to please the fans of the book by including certain scenes and dialogues verbatim, but invariably, they will dumb down the content. Whether they believe this will help their product reach a wider (presumably dumber) audience is uncertain. 3. This is not to say that either of the movies is terrible. Both of them are ‘good enough’. Humour and Romance were the essence of both the movies. There was scope for improvement in both the movies. Both movies were good attempts at providing Sunday afternoon entertainment, and both were definitely good enough for a one-time watch. If you want more depth, more insight, more food for thought, and most importantly, if you believe the original is always best… then, go for the books. The movies are an imitation, and have a definite agenda – let’s just stick to what works. Neither movie tries to explore further – they use the book as a blueprint, not a guiding light. They bring nothing new to the table. They play safe. Depending on your personal reading preferences, you might feel one, or both, of the books are not great literature. But at least they didn’t take the easy route of repackaging something that was already out there – they tried to be creative, not imitative. And simply for that, they deserve better than to be judged by their copies. If you’re interested in the books, read our reviews of TFIOS and 2 States. For more ‘movies vs. books’ rants by our rabidly book-loving writers, read comparisons of The Shining, Life of Pi and Midnight’s Children.